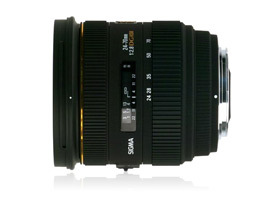 As a standard zoom the Sigma 24-70mm f2.8 IF EX DG HSM is ideal for general-purpose photography including portraiture, candid, landscape and reportage. Introduced in 2008, it boasts an impressive spec to rival any of the big-name brands. The optical construction consists of 14 elements arranged in 12 groups and, as you would expect from Sigma, it adopts aspherical elements, as well as liberal use of low-dispersion glass for reducing the effects of chromatic aberration. It also features a quiet sonic type AF motor focusing to a minimum distance of 15” (38cm) as well as rounded diaphragm opening for softer transitions to out of focus area. With an 82mm filter thread and 3.5” (89mm) maximum diameter it’s not exactly a small lens but it is shorter than average, measuring 3.7” (94.7mm) in length and weighs in at 27.9 oz (790g). 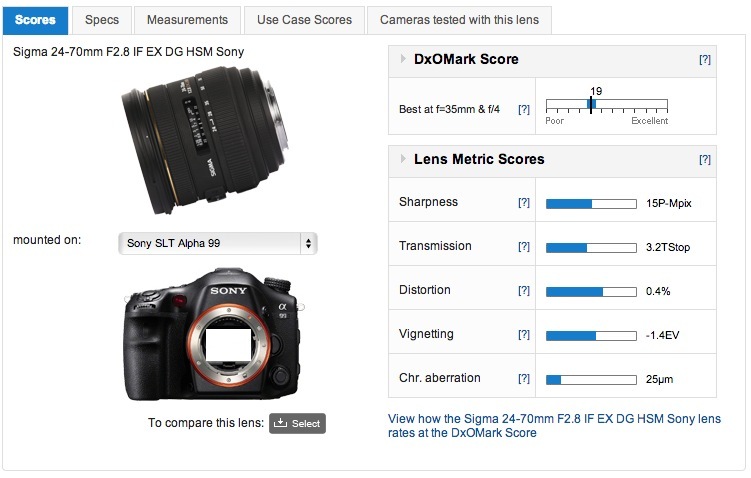 Mounted on the Sony SLT A-99, the Sigma 24-70mm f2.8 is reasonably well corrected and achieves a DxOMark score of 19 points. A peak sharpness score of 15P-Mpix is very good, but sharpness at maximum aperture is variable throughout the zoom range. Sharpness is much better at 24 and 28mm than it is at the longer end, at least in the centers but corner sharpness wide-open is poor. Stopping down to f4 improves uniformity at the wider end and enhances center sharpness at the other – in effect the longer end is stops behind. Distortion is noticeable at either end and is vignetting, but it’s very low between the 35mm and 50mm range. Lateral chromatic aberration is somewhat troubling, however; it’s particularly evident in periphery at the wide-end (24-28mm) and it’s noticeable regardless of the aperture value. We’ve compared the Sony mount Sigma with the Sony Zeiss Vario-Sonnar T* 24-70mm f2.8 ZA SSM, a huge lens with an equally impressive optical construction and $1,599 price tag. 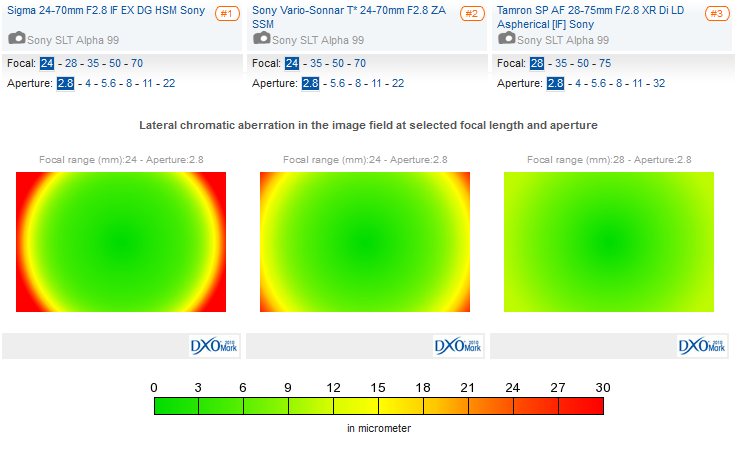 We’ve also taken the opportunity to compare with it the Tamron SP AF 28-75mm f2.8 XR Di LD Aspherical [IF]. Although Tamron make a newer SP AF 24-70mm f2.8 Di USD (ultrasonic) model, the price is $1,299, yet the older lens is just a fraction of the cost at $499. Looking at the models it’s not an easy choice. The Sigma and Tamron perform quite similarly; although the former has higher central sharpness at the shorter focal lengths, the Tamron is the better performer of the two from 35mm to 75mm (at least up to f8). The Sony Zeiss model on the other hand is without doubt the best, but wide open at 35mm and 40mm the Tamron isn’t so far behind. 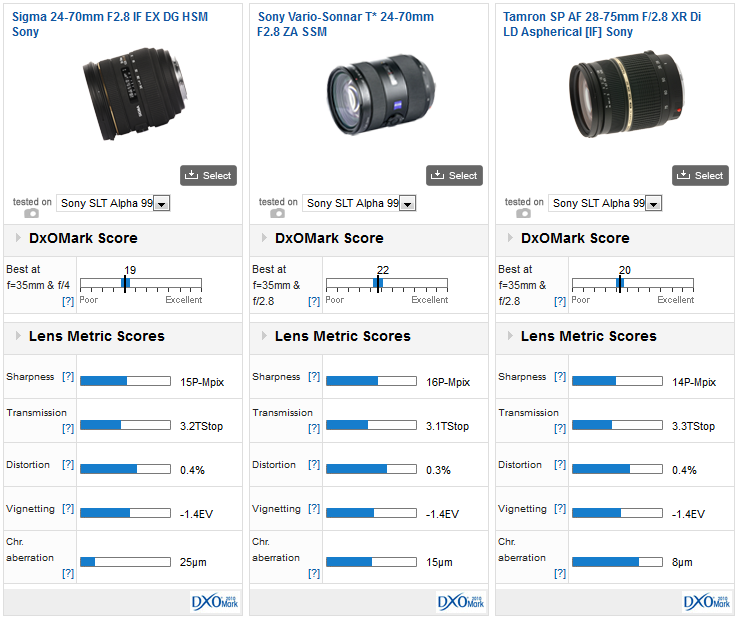 Stopping down just one stop to f4-5.6, however, soon shows the superior uniformity of Zeiss. Perhaps the biggest drawback with the Sigma is the high CA. At 24mm and to a slightly lesser degree at 28mm it’s noticeable in the corners at every aperture. The Tamron is untroubled by it but even the Zeiss has some at its widest. Note the heavy lateral CA on the Sigma wide-open at 24mm (and it doesn’t improve on stopping down). Over image quality is good and both sharpness and uniformity are good when stopped down a little but the Sigma has high levels of chromatic aberration, particularly at the shorter focal lengths. Given the performance and the inclusion of an ultrasonic type AF motor, it’s fairly priced at $899, but still somewhat overshadowed by the better corrected and more accessibly priced Tamron.